Donna Eschen, moderator of American mahjong at the Elwin Mussell Senior Center in Santa Maria, received her first mahjong set as an inheritance from her mother. But learning how to play mahjong is no easy task, Eschen said. Mahjong originated in China, and includes Chinese characters, numbers, and symbols on tiles or cards. The regular Elwin Mussell Senior Center program focuses on American mahjong, which is a unique form of the game. Beginners are welcome to attend mahjong at the senior center, but Eschen doesn’t suggest coming in blind. American mahjong—not to be confused with Asian mahjong or mahjong solitaire—is played with four players, representing the four winds (north, south, east, west). The table acts as a compass, with north sitting across from south, and east sitting across from west. Mahjong uses 152 tiles, which are either kept or discarded throughout the game. The goal is to be the first player to match one’s tiles to a specific hand on the mahjong scorecard. Rounds go by fast and usually only last about 10 minutes. What keeps the game fresh, Eschen said, is that the hands change every year. The American Mah-Jongg Association distributes scorecards annually with different tile patterns to strive for. The association is currently in its 79th year. 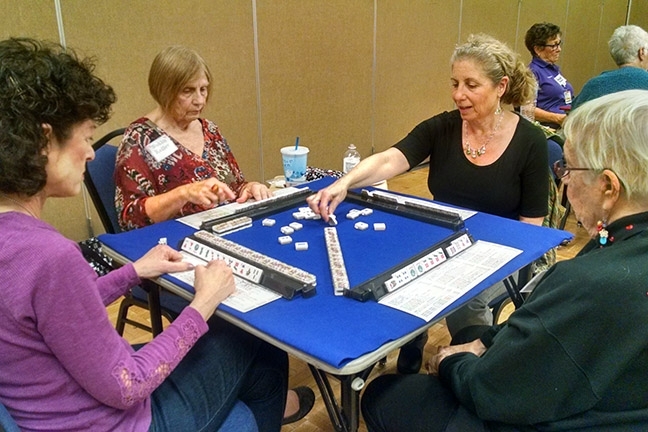 “Mahjong keeps your brain alive,” Diane McDonald said. 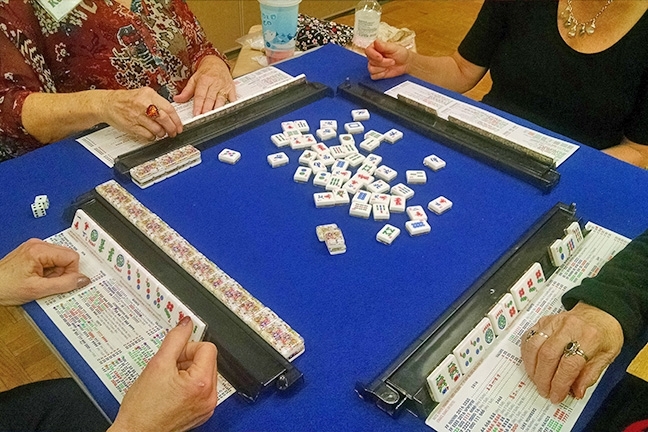 The players in mahjong represent the four winds: north, south, east, and west, even in American mahjong, which is played at the Elwin Mussell Senior Center each week. McDonald is a regular player at the senior center, which has been hosting the game weekly since 2014. “It can be fun and brutally challenging at the same time,” she added. Although mahjong requires skill, luck plays a part in the game as well. Another player at the senior center, Jean Jacobs, once scored a “heavenly hand,” which can only occur when you’re the dealer (east), and your first 14 tiles are already a perfect pattern. But attendees at the regular mahjong sessions and tournaments aren’t there for the fabulous prizes, but the camaraderie, the game, and of course the possibility of a “heavenly hand.” But they do put some money down in tournaments. 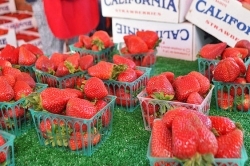 American mahjong takes place every Friday and on the first and third Wednesday of every month from 11:30 a.m. to 4 p.m. in the Audrey Silva Assembly Room of the Elwin Mussell Senior Center, located at 510 Park Ave., Santa Maria. For more information, call 922-2993. The most valuable hand on the scorecard can win 75 cents from each opponent at the senior center. Those stakes aren’t nearly as high as those at the annual mahjong tournament in Las Vegas—which Eschen is attending this year along with a few other players from the senior center. Intern Caleb Wiseblood is sticking with Candyland. Contact him through Managing Editor Joe Payne at jpayne@santamariasun.com.